Like to get out and explore the nature as well as the towns and culture in a country? In this itinerary, you will climb the hills of Lisbon while exploring the charming neighborhoods, bike though meadows of cork and olive trees and vineyards, walk across the bluffs and cliffs overlooking the Atlantic, and enjoy the spectacular caves and rock formations from the water. Come fill your lungs with fresh air, while enjoying spectacular landscapes. Rejuvenate your body and soul while spending some activity-filled days surrounded by nature. On your arrival in Lisbon, we will welcome you at the airport and transfer you to your first hotel. Depending upon your arrival time, a private guided afternoon walking tour will give you a good feel for the historic center of the city and its neighborhoods. Take a guided walking and tram tour of Belém in the morning – the part of Lisbon along the Tagus River dedicated to the explorers and explorations. In the afternoon, continue exploring this part of the city, take in a museum, or return to the historic center. 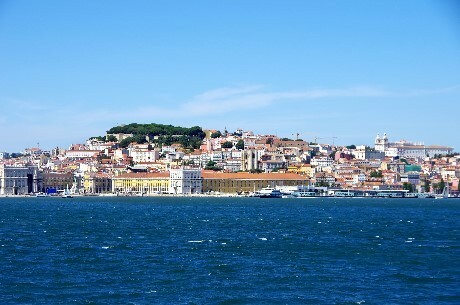 Or, take the boat across the river for a fantastic view of Lisbon from a different perspective. Enjoy fresh seafood with some chilled wine, while watching the sun set over the city. Pick up your rental car, and drive just 1.5 hours into the Alentejo, to Évora. A World Heritage town, Évora lies in the countryside, in a region filled with fields of cork trees, olive groves, sheep and cattle, vines and vineyards. It is a culturally and historically rich area, and it is known for some of the best food and wine in Portugal. This afternoon, enjoy a biking tour where you will ride through the narrow streets of Évora’s historical center, and follow the aqueduct inside the city walls. Then, you will head out into the countryside, where you will follow the eco trail, which runs along farms with typical countryside architecture, grazing animals, and the lovely aqueduct, originally from the 16th century. From Évora, drive along the wine route for a visit at a local winery where you will enjoy a tour and lunch. Then continue through a pottery making village, where you can see artisans working the clay into lovely decorative pieces. Then continue on to the tiny hilltop village of Monsaraz. Originally fortified by the Knights Templar, this fairytale village still maintains its medieval atmosphere, yet is home to some 100-150 residents. Morning bike tour through the green area of Valverde, where you will see some of the most emblematic megalithic monuments of the region of Évora: the cromlech and the menhir of Almendres (more than 5000 years old! ), and the big dolmen of Zambujeiro. You will also visit the ruins of Giraldo’s Castle, and the Roman ruins of Tourega. Somewhere under a tree you will stop for a bite of local cheese and chorizos and, of course, a good glass of wine! In the afternoon, relax in Évora, or head out of town to visit two of the ‘Marble Towns’ of Portugal – the marble rivals that of Carrera, Italy. In Vila Viçosa, nearly everything you see – the palace, door and window frames, churches, benches, sidewalks, and even the toilets in the bus station are made of the "white gold," that comes from the nearby quarries. Estremoz is the largest of the ‘Marble Towns’, with an upper and lower part of town, crowned by a castle, where you can enjoy a wonderful view of the town and the plains surrounding. 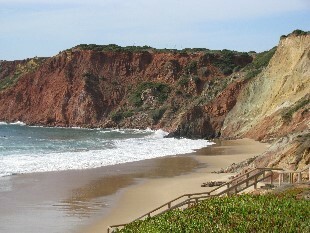 Continue south to the Algarve, to the southwestern-most point in Portugal. This is the most beautiful part of the Algarve, having avoided the development of the central part. It is more wild, and less touristy. Take the ‘old road’ winding through villages and beautiful rolling countryside. Stop at a beach along the way, for a walk or a drink with a wonderful view of craggy cliffs that plunge into foaming seas. Morning guided hike along the cliffs and bluffs, with a stop at the lighthouse, then a tour of the Sagres Fortress, where Henry the Navigator established his navigation school in the 15th C. In the afternoon, enjoy some local beach time, or explore a bit more of the Costa Vicentina or the southern coast to Salema, Ingrina and Zavial. Visit Lagos for the day, with a half day sail along the coast where you will see the impressive caves and rock formations of the coast and the "Ponta da Piedade”, with picnic included. (If you prefer, this could be a dolphin watching sail). Spend the rest of the day in Lagos. Return to the Lisbon area, to the fairytale village of Sintra. Lush and green, Sintra is home to castles, palaces, lovely gardens, fantastic manor houses, and a charming village center. 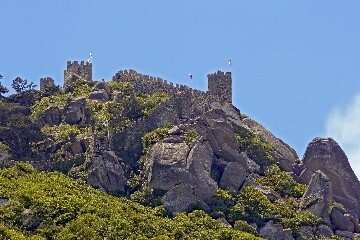 After checking out the town, hike up through the forrest to visit Pena Palace and the Moorish castle. Spend the day in Sintra, visiting the palaces and gardens in the center of town. Apart from the sites, there are some great walks and hiking paths in and around the town, as well as into the surrounding countryside. For your last day, take the car to explore the coast, and to visit the westernmost point in Europe – Cabo da Roca. Visit a winery for a tour and tasting, then spend the afternoon and evening in Cascais, formerly a quaint fishing village, that became (along with Estoril) a popular resort and then refuge favored by European nobility and kings in the 20th century. Today it is a colorful town with cobbled streets, and plenty of shops and restaurants.